This installation requires us to actively participate in its interpretation in order to synthesize our own valuation of meaning: Why should a bathroom fixture stand at the center of such a dazzling multi-dimensional display? If we engage ourselves fully we discover a model for another reality, in which a bathroom can function as a resonating chamber for the synthesis of thought. 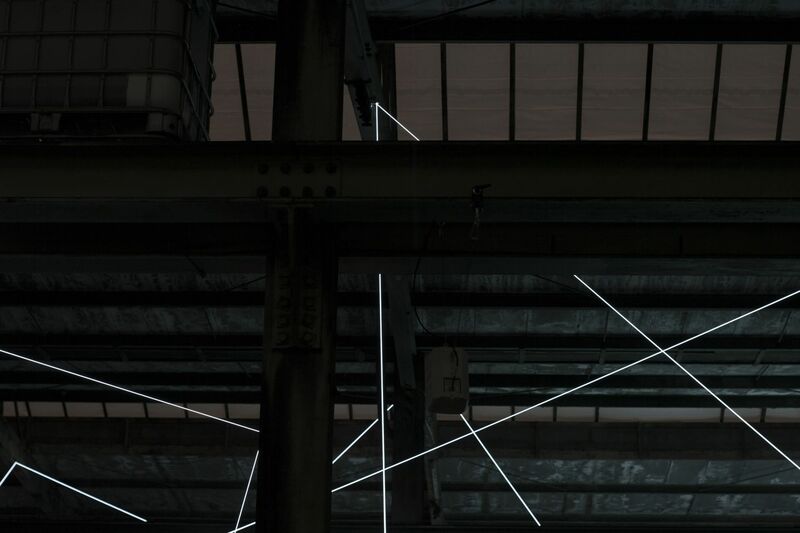 The network of luminescent cables are the edges of an array of invisible intersecting planes. If we stand still and close one eye, our depth perception is temporarily suspended and we can experience fleeting moments of illusory flatness, as the brightness of the cables is perceived as uniform and space is fragmented into spontaneous geometry. Yet as soon as we begin moving again we are delighted with the dynamic interplay of the cables as they expand and contract in relation to our position in the garage. The vector space can be understood as a force field which interacts with the object. 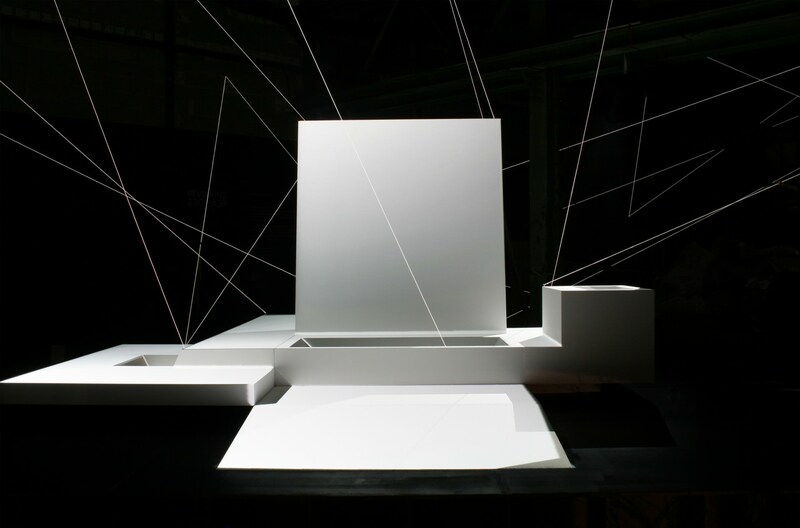 The object's surface fluctuates and shimmers under impossible lighting schema, granting it with a simulated inner life. 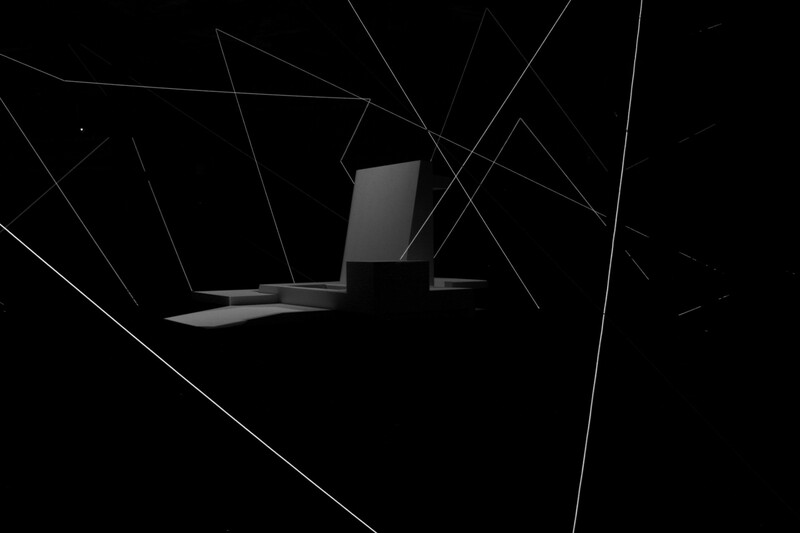 Its virtual innards are intermittently revealed to us; we experience the object as a simulated 3D solid that is sliced by invisible planes of the vector space. 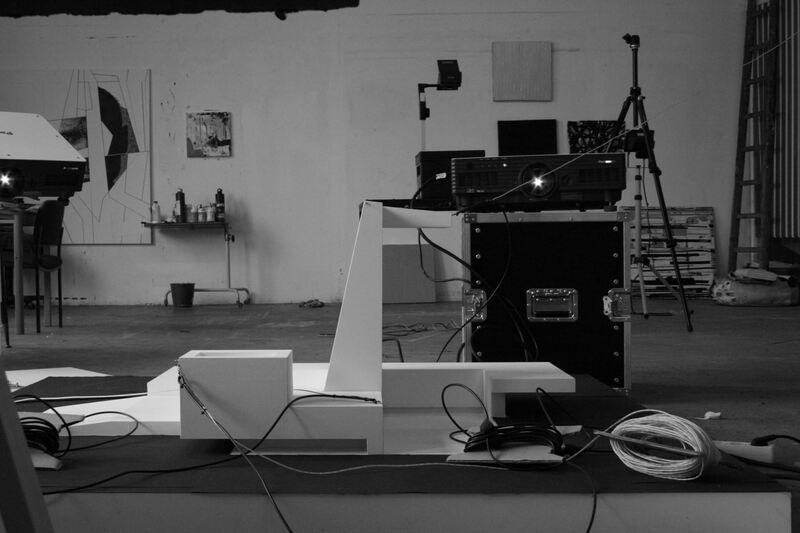 The array of audiovisual vectors define the invisible planes which cut through the sculptural object, amplifying its energy into an architectural orbit of audiovisual synaesthetic activity. The multi-channel audio fills the parking garage to create a volumetric sonic field. Each strand of electro-luminescent cable is mapped to one audio channel and is programmed to react to variations in the sonic signal. As time passes we recognize that this wholly synthetic space has a personality, albeit one which we actively participate in creating. It seems to be in dialog with itself; oscillating between modes of moody contemplation, childish curiosity and confrontational antics. We recognize the system as a model for consciousness; it amuses itself and we witness its abstract ruminations as tangible spatial mutations. The complexity of its dramaturgy is tantamount to the implosion of the orchestra and the ballet; each element collapsing and unifying the roles of instrument and dancer, creating an ensemble of synapses. 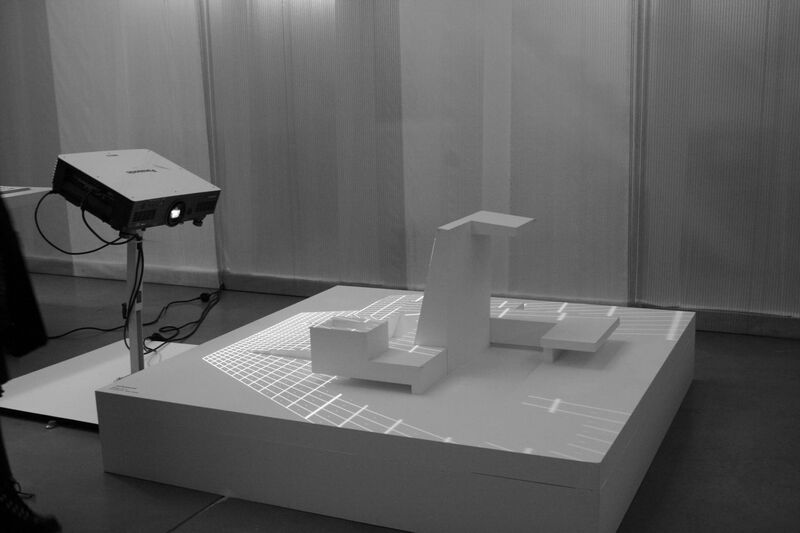 As the object's surface ebbs and flows by means of digital projection surface-mapping, it allows us to superposition it across various archetypes of the digital age. One moment it is a lost polygon from an esoteric video game landscape; the next moment its a mysterious engine from an alien spaceship, or perhaps a novel form of matter which is both crystalline and liquid at once. This hypercubist sculpture – its surface moving in time while its volume remains paradoxically still – is a fractal seed for the expression of future media universes and our role within them. We can traverse the vector space freely; no particular vantage point is privileged. The cables and sculptural object transcend their mundane physicality into grand metaphor, the activity of which comprises both a digital ritual and an analog prototype for a not-yet-invented digital medium. If we allow our imaginations to project into the future, our encounter with the installation provokes an impending sense of the holographic. 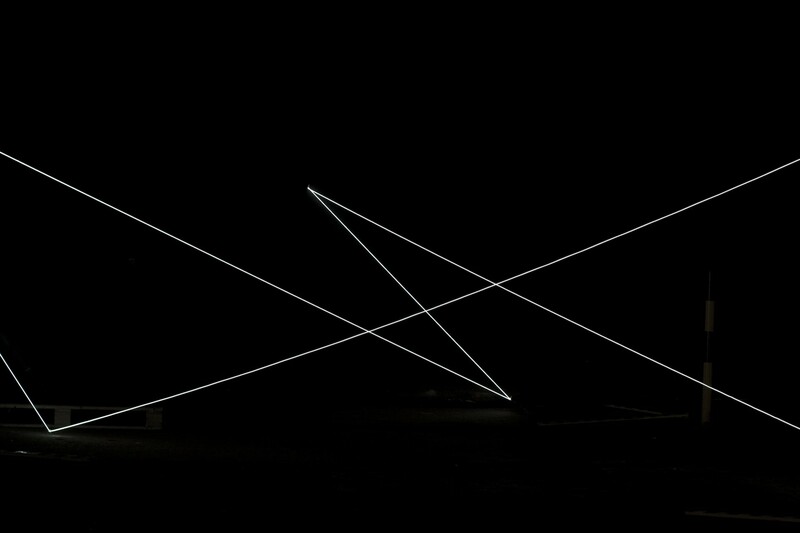 10.2 channel audio, 1500 ft. DMX-controlled, electroluminescent wire, 360º quasi-spherical light projections. Duration ~90 mins.